Colour t-Hair-apy is an awesome Salon and Oxygen Bar located at 612 E Douglas in Wichita’s Old Town, right across the street from Naftzger Park and oh so close to many wonderful restaurants, shops, bars, and other fun establishments. The business owner, Jennifer Steadman, has been my personal hairstylist for years, so when she moved her business from Hutchinson to Wichita soon after we made the same move, I was beyond excited. Of course, along with the new venue came the need for “new everything else,” including a new website, and we have had so much fun creating the perfect online presence. 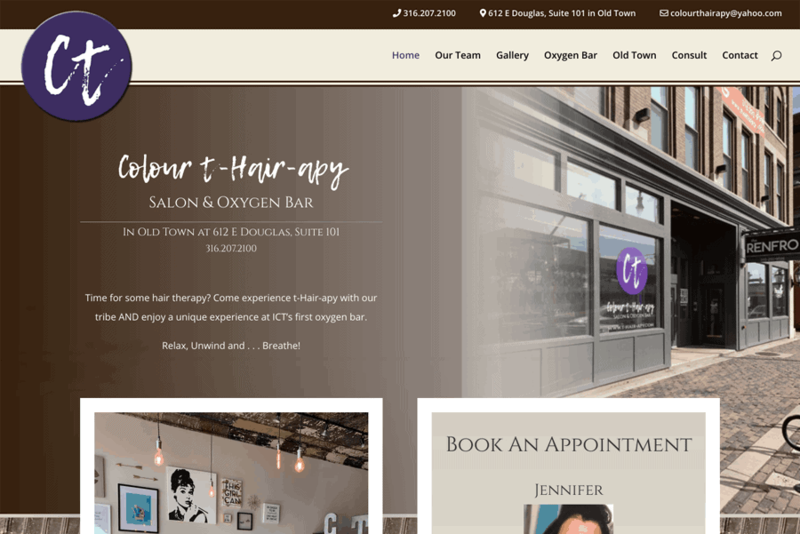 Jennifer, Jayme, and other members of the team at Colour t-Hair-apy provide the very best in luxury services, including hair colour, extensions, brow and lash enhancements, fun and therapeutic oxygen treatments, and relationship building. They are proud to provide the first Oxygen Bar in Wichita, with many flavors to choose from. On the website, clients can book hair and O2 appointments, set up free consultations, view photo galleries of stylist artistry, and even see what’s happening in Old Town. It’s a fun website for a fun group of gals!